Alright, time for a confession - I don't even like chocolate that much! My friend, Janet Earl, and her aunt, Brenda Anderson, have a great start-up business: Garden to Gourmet Goodness. They make james, preserves, salsas, pickles - BUT . . . these ain't yo' Momma's preserves! Whether it is Blackberry Wine or Peach Amaretto, these ROCK! My favorites are her line of savory preserves - and let me say, a dollop of her Roasted Onion and Garlic preserves on a hamburger is ambrosia! Chocolate is made for lovers! Garden to Gourmet Goodness was set to be at Chocolatefest Knoxville, with their signature preserve, Raspberry Chocolate Sauce. And while the product - served up on brownie and cheesecake bites - would draw a crowd, how about upping the ante and creating a buzz, that the good people would find fun? 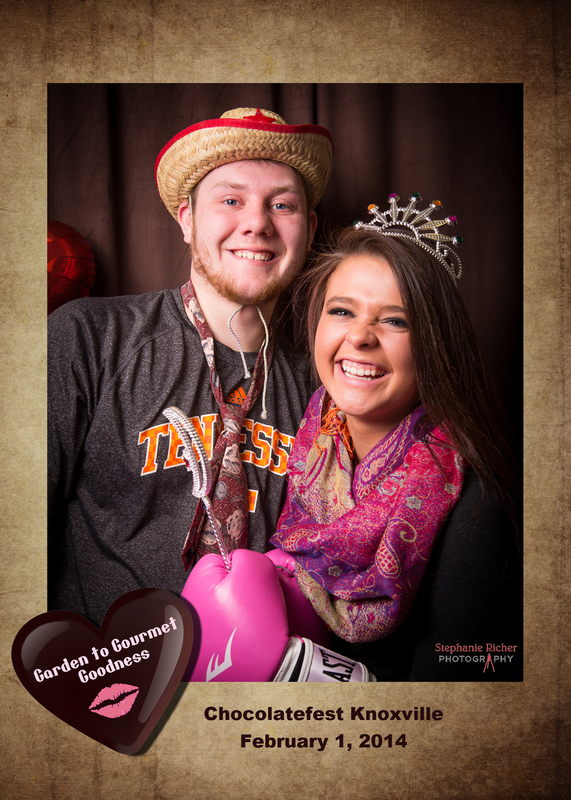 And what is more fun than a free photo booth? 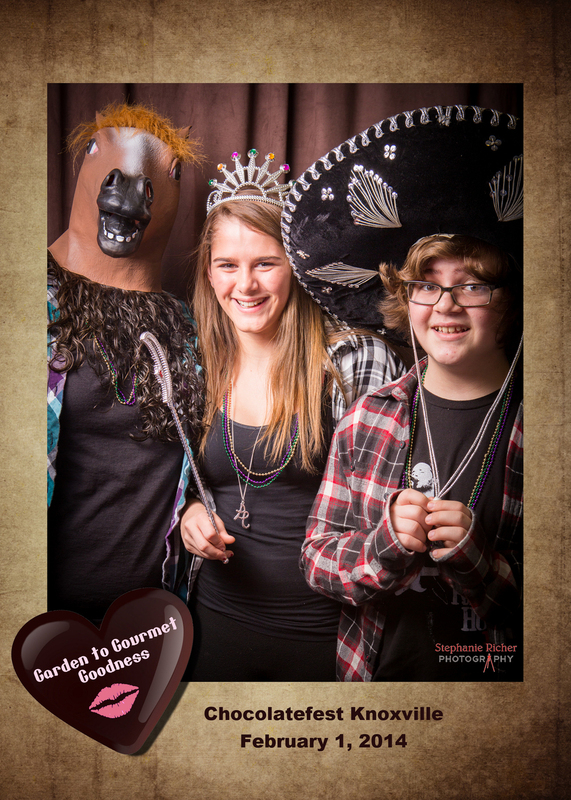 I set up a simple brown backdrop - this was a chocolate festival, after all - and brought in some fun props. A sombrero, a tiara, silly glasses, pink boxing gloves . . . and the ever poplar horde head mask for the shy (or maybe the strange, hard to say). It was great - I took the pictures and designed a digital frame so that if someone wanted to print out a 5x7 print, all they would have to do is drop it in a frame. Folks signed a model release, and in doing so also gave their email addresses, so that I could set up a private gallery and send them a link to download their pictures. This is a great idea for a business to set itself apart at an event like this. The people get a take-away, and the business not only gets to send them something they want (FREE photo!) and will remind them of the brand, but the emails serve as a potential customer list to send promotional offers or invite folks to subscribe, say, to a newsletter. 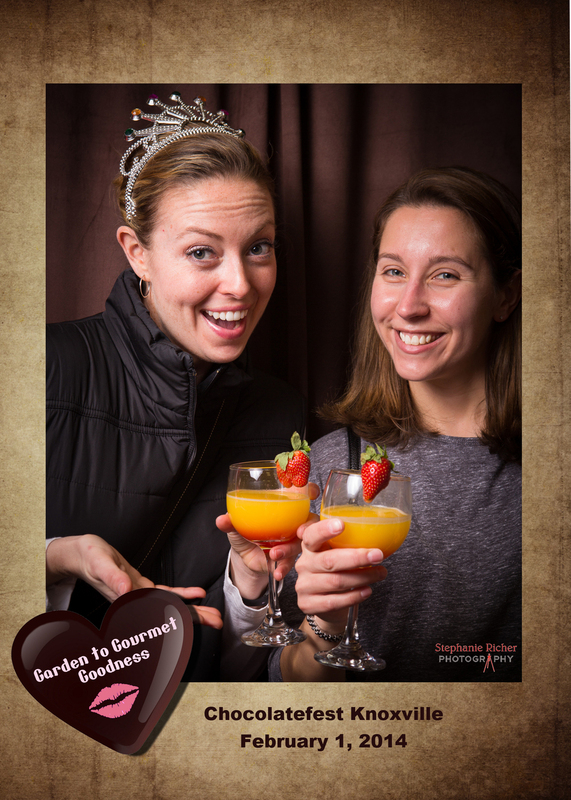 Photo booths generate laughs and happy memories at parties and weddings - so why not bring that fun to your next appearance at a trade show or festival? Call me and let's discuss what we can do to make your business stand out . . . and have fun!